With Google investing $300 million to compete with TV and producers looking for alternative mediums to showcase original programming, you’d better believe that everything about YouTube is business. There are millions of dollars to be made and that means expectations and tensions are high. Even YouTube elite aren’t immune to the growing pains, some of which are playing out in the public’s eye. These days the public spats between YouTube production companies and their talents tend to stem from contractual disputes that leak out into the public every now and then. 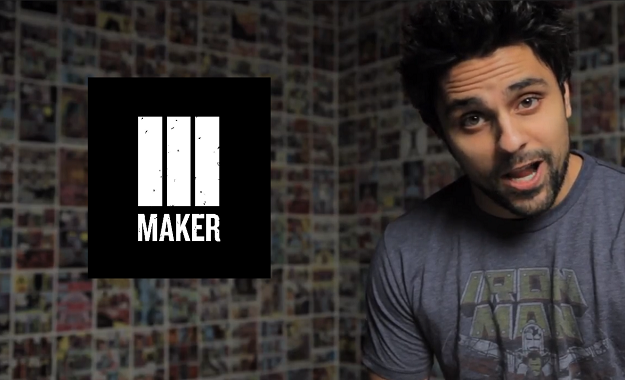 One particular fight that has reached new heights is between Infamous YouTuber Ray William Johnson and his former employer Maker Studios. Johnson took Maker Studios to task in a very public post on NewMediaRockstars, blasting the YouTube model and the studio itself. It all began back in May when he announced he was leaving Maker Studios in a cryptic video, which caused fans to speculate what exactly went wrong. The mysterious announcement “was vague, so as not to stir up any controversy or speculation,” Johnson writes. Maker at the time responded saying that Johnson was returning to producing his show =3 (read as Equals Three) solo because of a decline in viewership and the fact that “Maker providing a full team of writers no longer was a viable option for =3.” But fans were never given a real explanation as to what happened … until just a couple of days ago. 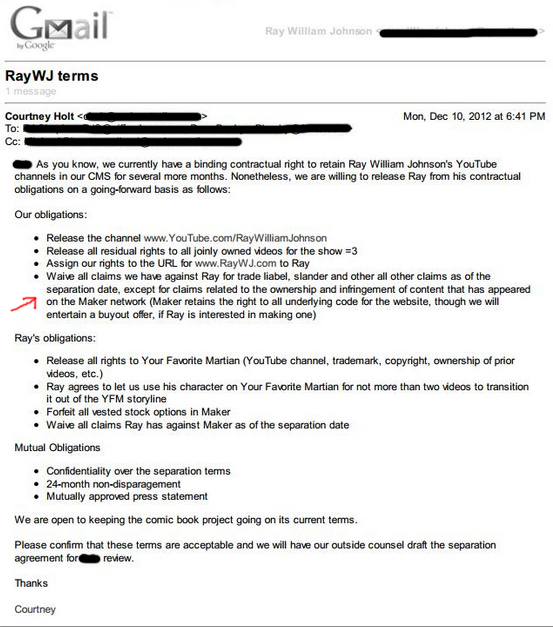 What happened (and note that this is from Johnson’s point of view) was that Maker Studios reportedly wanted Johnson to sign a more aggressive contract that would have required him to sign over a larger percentage – 40 percent, to be exact – of his YouTube channel’s Adsense revenue and 50 percent of his intellectual property until perpetuity for his successful show, =3. Considering that Johnson was single-handedly accountable for 23-28 percent of Maker Studio’s monthly unique views, it’s safe to say that his show was generating the most Adsense revenue. He was reportedly making $1 million annually, and is the most popular YouTuber to date with over six million subscribers and over two billion video views. As you can imagine, he shot down the new contract terms. But according to Johnson, Maker was using existing projects as leverage for the contract. “48 hours later [Maker] shut down the Your Favorite Martian album that I had been working on for eight months. A day after that, they shut down production on =3, a show that has been running strong for nearly four years – all of this in hopes of strong-arming me into signing over my intellectual property,” Johnson writes. He makes other personal claims, such as bringing up Maker CEO Danny Zappin’s felony charges, which Zappin himself regretfully confirmed to his employees in a company-wide email. Johnson does back up his side of the story with documented evidence about what Maker promised Johnson (below). However he only offers circumstantial evidence in the form of a written statement since he hasn’t provided the documents proving that Maker was withholding his Adsense account. We’ve reached out to multiple sources in the YouTube community for comment, but so far all have declined to offer their input. In the wake of Johnson’s very public rant, Zappin sent a company-wide email that NewMediaRockstars got a hold of, addressing the allegations. “What I can say is that we continue to honor our obligations,” Zappin writes. “Ray receives everything that is owed to him. He has full transparency into his earnings, as does every single talent in the Maker Network. He receives exactly what his channels earn under the terms of our deal.” If Johnson was right and Maker was holding his Adsense account hostage to use as leverage in the deal, it would look as if his public airing of the ordeal was effective. “Ray. Your lack of integrity and character is sad. Your lies will not go without a full on expose about your selfish ego driven actions and the real truth. Maker will not tolerate lies of low life ego-maniacs that think they are better than everyone else. I will reply and lay out the facts in great detail since you feel this needs to be public. I have emails, contracts, revenue data, and interviews with Maker staff and behind the scenes footage of your actions. The truth will prevail. We won’t allow you to slander us with lies without responding. I’m sorry you have taken it to this level. Stay tuned. Whatever the case may be between the two parties, we’re getting a taste of the sour side of YouTube business. Companies like Maker Studios are still in startup mode, although the company received a $40 million investment from Time Warner. But YouTube studios really are scaled down versions of Hollywood studios like Warner Brothers and Sony Entertainment. They’re managing talent, directors, costume and makeup, prop designers, producers, and other staff while producing content on a near daily basis. And beyond Johnson and Maker, how this public spat plays out could change and influence the course of the relationship between startup studios and the YouTube personalities that they sign.